Now a days, chewing gums have become a favorite eatable for young kids. The supermarkets often display them at areas visible to young kids and even the parents who doesn't know about the bad effects of eating plenty of chewing gums, always buy them for their kids, when they cry. A recent study, has found that chewing gum could make people (especially the kids) fat since its mint taste makes sugary food more tempting. 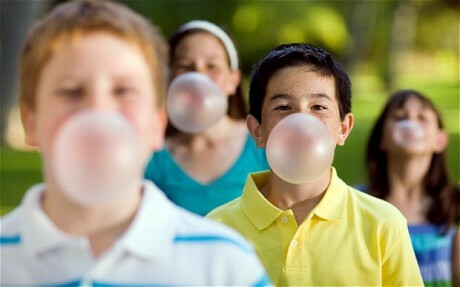 Scientists found that kids who eat plenty of chewing gums, eat more high calories of food than other kids. This is because, the chemicals responsible for the minty taste in the chewing gums make the tastes of nutrient food like vegetables and fruits very unpleasant. Thus the children avoid these foods and starts eating only junk food. As a caring parent, it is always safe to avoid your children eat plenty of these chewing gums.